These next few photographs will highlight some Hammarlund paper items. The picture on the left is of the front cover of a Hammarlund Catalog and is dated 1940. 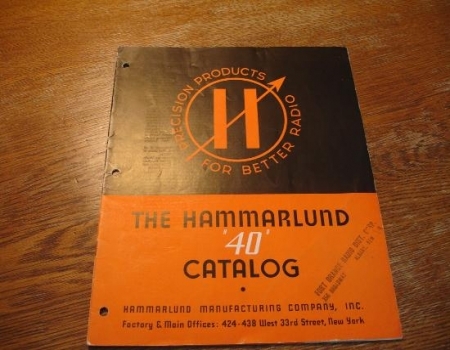 Inside this catalog it states that it is Hammarlunds 29th year. The ink stamp on the lower right of the front cover reads "Fort Orange Radio Dist. Corp." and their address is in Albany NY. 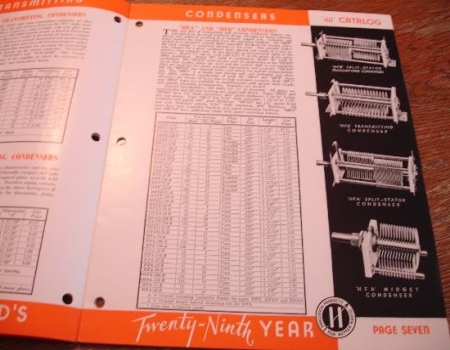 The picture on the right is a random inside photo of the Hammarlund catalog showing an ad for some condensers. Today these "condensers" are known as capacitors or as shown in the picture, air variable capacitors. 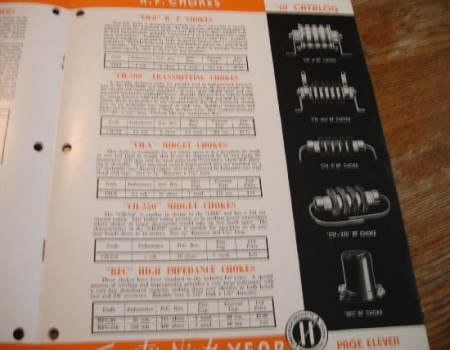 Two random pictures of the inside of the Hammarlund catalog showing an ad for some condensers on the left and some chokes on the right. A few more random pictures of the inside of the Hammarlund catalog. 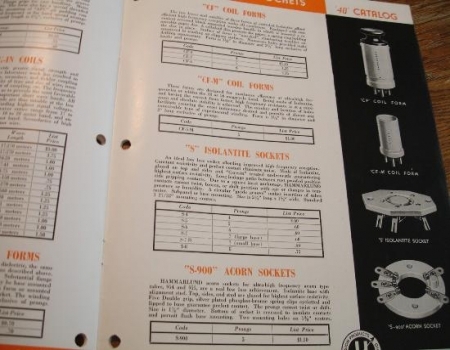 The photo on the left is showing an ad for some coil forms and isolantite and acorn sockets. 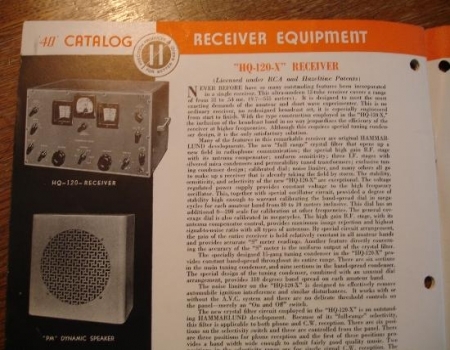 The picture on the right shows an ad for the Hammarlund HQ-120x receiver and a PM speaker. 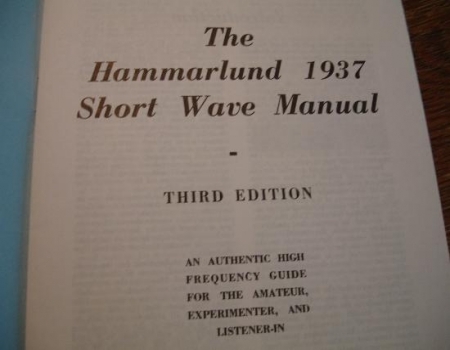 These next few photographs are of the 1937 Hammarlund Short Wave Manual. The picture on the left is of the front cover while the picture on the right is of the first page. On this picture on the right we can see that this is the third edition of this manual. 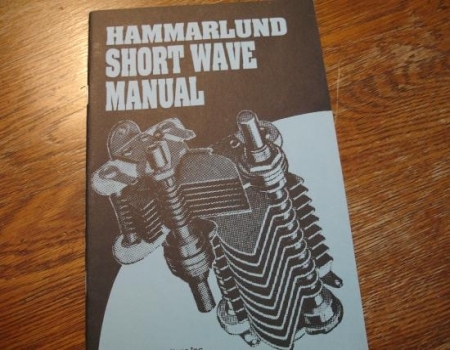 These next two pictures are of random articles that are printed in the Hammarlund Short Wave manual. 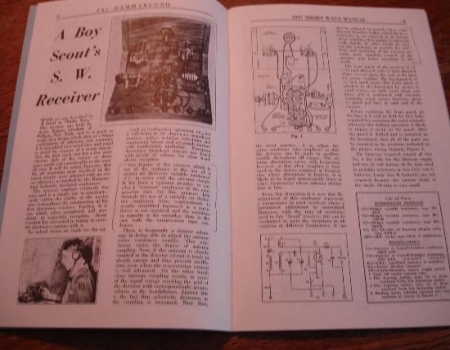 The picture on the right is an article titled "A Boy Scout's S.W. 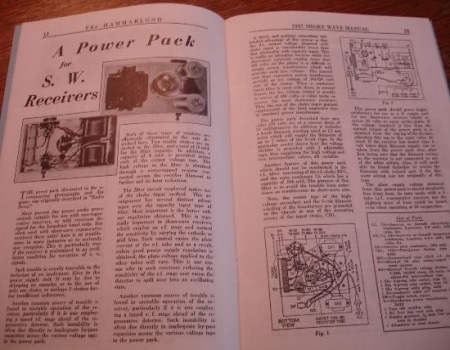 receiver" and on the left picture we have an article titled "A Power pack for S.W. receivers". 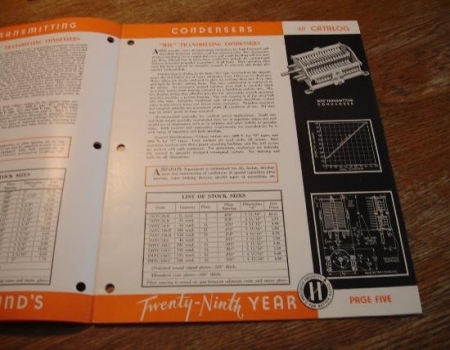 If you are an old radio buff then you will surely find the articles in this manual very enjoyable and informative.